It had been too long since I had last had shrimp and I was craving some. I remembered seeing a recipe for caramel shrimp a while ago when I was looking for recipes for the kabocha simmered in caramel sauce that sounded good. Apparently simmering or braising in nuoc mau (Vietnamese caramel sauce) is fairly common in Vietnamese cuisine. Generally if you want to add some sweetness to a recipe you just add some sugar but why not take the opportunity to add some flavour at the same time by using caramel instead of sugar? I am getting better at making caramel the more I make it and this time it came together easily and without any problems. The caramel shrimp was nice and quick and easy to make and turned out great! I really enjoyed the sweetness and saltiness of the sauce on the succulent shrimp and there was just the right amount of heat. The caramel flavour in the sauce worked really well! I served the caramel shrimp on coconut jasmine rice and the rice soaked up all of the extra sauce and became super tasty. I will definitely be making this again though I think that next time I will add some lime juice for a touch of tartness. Heat the sugar and water in a large pan on medium-high heat until it caramelized and turns a dark brown. Add the shallot, garlic, ginger and chili and saute for 3-5 minutes. Add the shrimp, 2 tablespoons of the caramel sauce, fish sauce and pepper and simmer until the shrimp is pink all over, about 2-4 minutes. Remove from heat and stir in the sesame oil and cilantro. Try” pile of recipes. I’ll even put it at the top. I’ll have to make this one for my Dad, he loves shrimp. Beautiful picture! Off to my kitchen, and making it now. I’m sure it will be delicious. This is something I would definitely make and enjoy because it’s soooo different. Can I bring myself and my pack to your home? Definitely no boring meal at your place Kevin! I had this one kevin..Isn’t it yummy and worth cooking ? Aahh, another meat-free option. This looks delicious, Kevin and I will try this soon, for sure. Just finished our dinner, this recipe was delish! Thanks. Sounds very interesting, looks really yummy. Ooh this looks amazing! I am going to try and make your dish this week! You never cease to amaze me. You have such a flare for Asian cuisine. Bravo! Delicious! A beautiful and flavorful dish! 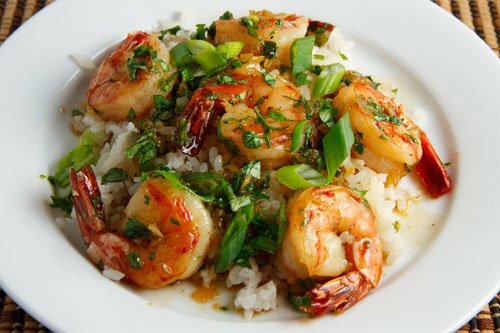 I love the caramel with the shrimp – the picture is making me want to eat that right now! I never had shrimp this way, but oh boy I’ll have to try it! That sounds like a wonderful new way to enjoy shrimp! Sounds easy enough and the results are well, very appetizing! You always have such appealing ideas over here Kevin. Why not add flavour!!! Fantastic looking!! I am sure it’s yummy. Fantastic sounding kevin…I LOVE the sound of this! WOW!! have a great & delicious 2009!! A sweet & sour touch to the shrimp. I like the notion! I always love when you come up with things where I have just about all the ingredients in the pantry and freezer!! This looks great…..
Looks absolutely delicious! Definitely going in the newly created “2009 recipes to try” file!! Looks wonderful! I can’t wait to try this caramel sauce. Sounds and LOOKS delicious! The flavor combination has to be amazing! Oh, man! Does it get any better? Except for my youngest we LOVE Asian flavors and shrimp!!!!! You know what else is great? Because it has “sauce” my daughter will eat the rice w/it and not complain!!! Thanks for sharing the recipe. This is one of several shrimp dishes that the kids will be gobbling up. Shrimp seems to be popular right around the blogosphere. Yay! I love Vietnamese Caramel dishes! I’ve never tried shrimp, but I really enjoy pork. That’s a really interesting twist that never would have crossed my mind. I’ll have to try this out! Caramel isn’t easy to make, I’ve had so many problems with it! I’ve never thought of combining it with shrimp, it sounds like a heavenly match! Beautiful picture and the recipe sounds so good. Kevin, what is fish sauce? I have a recipe I’m wanting to try with red curry/shrimp and it calls for a couple tablespoons of fish sauce. It sounds just gross to me… is it a fishy taste or smell? I just can’t figure out what the ingredients might be! This sounds so different and delicious! I still have leftover caramel from the Nov Daring Bakers Challenge, maybe I will take a shortcut and go that way instead! Thats a great recipe. I love shrimp & love what u have used here. except i am wondering what I can use instead of fish sauce.. Not very fond of it. Looks great, I’ve tried caramelised pork but never shrimp! Soma: I would think that soy sauce would work. You must try this… it is a favorite. I cannot wait to try yuor shrimp! Kevin, thanks for the info about the fish sauce! It does just sound awful to me, but I’ll give it a try so I can make the recipe as given. Caramel? So it is a sweet dish? Looks great! I agree that some lime would make this even better. tigerfish: Yep, sweet and salty and spicy. // Jennie, a swedish food-blogger. That sounds delicious. Can’t wait to try it! I’m attempting a post for National Sauce Month which is celebrated in March and I was hoping you wouldn’t mind if I “borrow” your link for Vietnamese Caramel Shrimp, which sounds especially delightful at this very moment. It should be up by tomorrow (24th) so if there is a problem, please let me know. P.S. I should confess, I’ve been a “lurker” for a while now. I actually found this recipe because you have been in my search engine for some time now. Just had this for dinner. SO delicious and simple. Thanks for sharing. I made this delicious recipe for dinner tonight. We added cabbage, spring onions and peas. I made this! It was terrific. Hi Kevin – we tried this tonight. Sounds so delicious.. but it was way too salty – maybe 2 Tbls of fish sauce is too much? ?